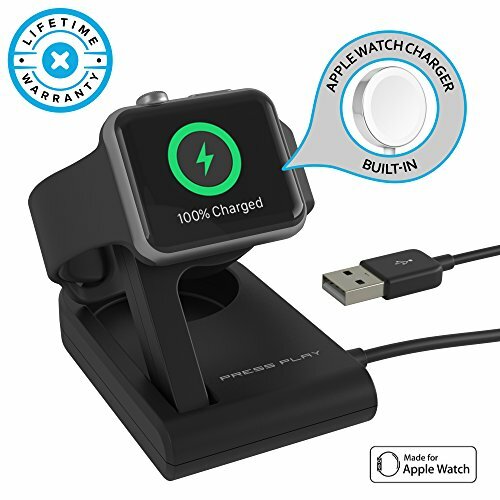 Easily charge your Apple Watch ONEDock Solo. The built-in Magnetic Charging Module aligns your Apple Watch magnetically, so you can begin charging instantly. APPLE CERTIFICATION - Made for Apple Watch 38mm/42mm & Series 1/2/3. Charge with Confidence. ON-THE-GO - Solo completely folds in flat to take with you anywhere. Also enables user to adjust the angle for a perfect view. RUBBERIZED COATING - To give a long lasting premium look and feel. LIFETIME WARRANTY -"LIFETIME" By PRESS PLAY to ensure that our products work the way you need them to. If you have any questions about this product by Press Play, contact us by completing and submitting the form below. If you are looking for a specif part number, please include it with your message.